Pu-erh is an ancient healing tea picked from 500-year-old organic wild tea trees in the mountains of China�s Yunnan province. Once picked, tea leaves are piled, dampened, and turned over a 60-day period. 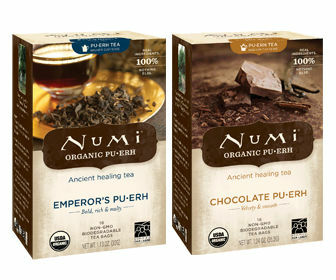 We carry Numi Chocolate Pu-erh, a velvety creation that combines black pu-erh tea and organic cocoa, and Emperor�s Pu-erh, a deep, bold concoction that is smooth and earthy with hints of malt. Enjoy them both in this assorted case of six 16 packet boxes, totaling 96 tea bags.